Will the real (reel) Lincoln please stand up? 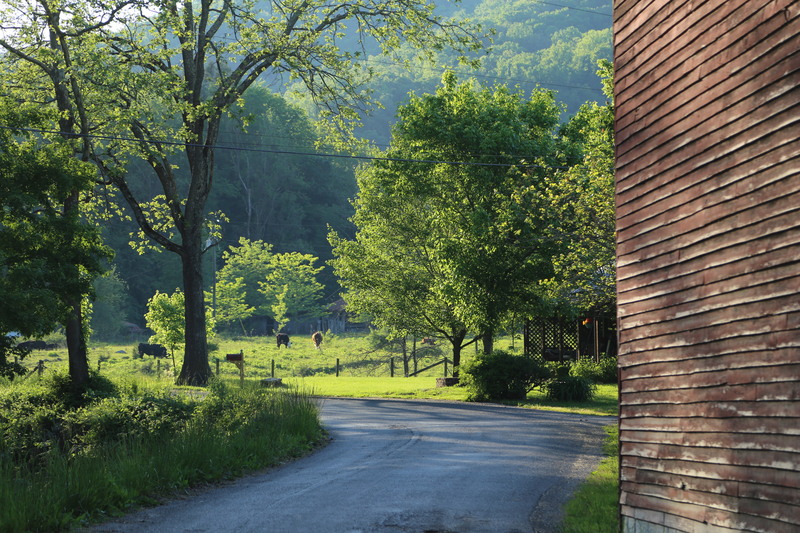 View from Route 38 of a coal-mining road in the hills along the Virginia-Kentucky border, Lee County. In the 1700’s this region was mostly uninhabited and coveted as a rich hunting ground by Native peoples. Migrating bands of Cherokee, Shawnee, Chickasaw and other tribes entered this wilderness at their own risk, frequently clashing but the payoff was well worth it, particularly in winter when food and game elsewhere could be scarce or too competitive. 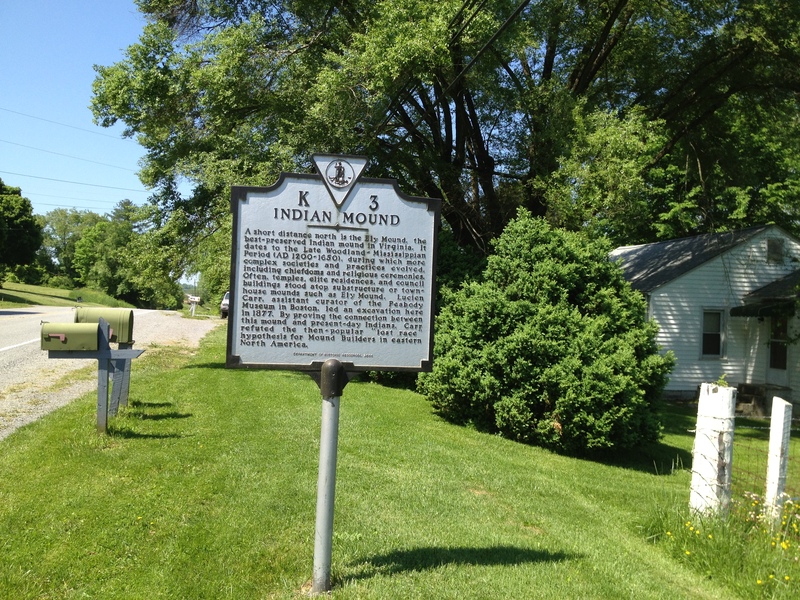 Additionally,not well known is the fact that in the first two centuries of settlement before it became absorbed into English North America, the region was quite a mixing bowl of cultures and peoples; visited by Spanish conquistadors, French metis, Ulster Scots, German farmers, English settlers, and later on by both free and enslaved blacks. Early explorers included backwoodsmen, “longhunters” with colorful names like Elisha Walden, Uriah Stone, “Big Foot” Spencer, and of course that mainstay of American folklore, Daniel Boone. Less known are the many heroic frontierswomen who endured incredible hardships, like Mary Draper Ingels and “Mad Ann” Bailey; the latter served as a messenger in the French and Indian War and lived alone for a time in a hut atop Warm Springs Mountain. She was an expert guide to settlers and local militia in this rugged region also known as Allegheny; Algonquian for “endless”. 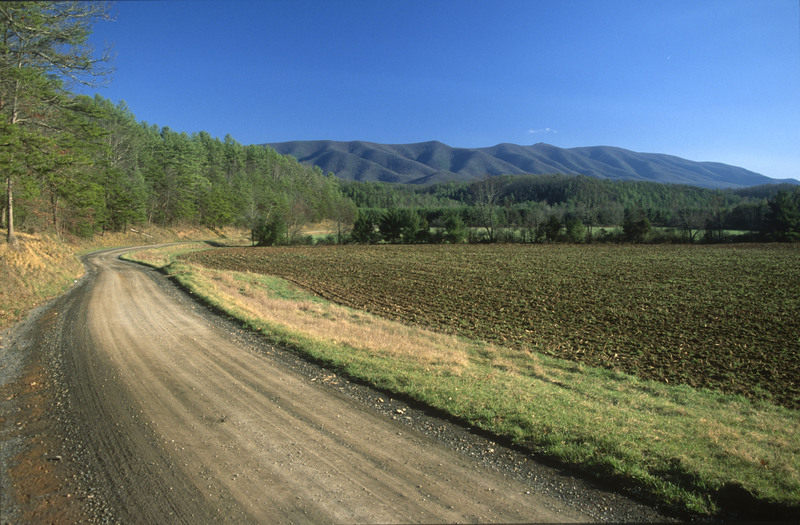 Understandably so; comprising the eastern high country of the Mississippi River basin and headwaters to several large rivers that flow to the Atlantic, this mountain realm is not as high as the Smokies but is far more extensive with long, parallel mountain ranges that run in a generally southwest-northeast alignment and whose heights attain an average elevation of between 2,500 and 4,000 feet. 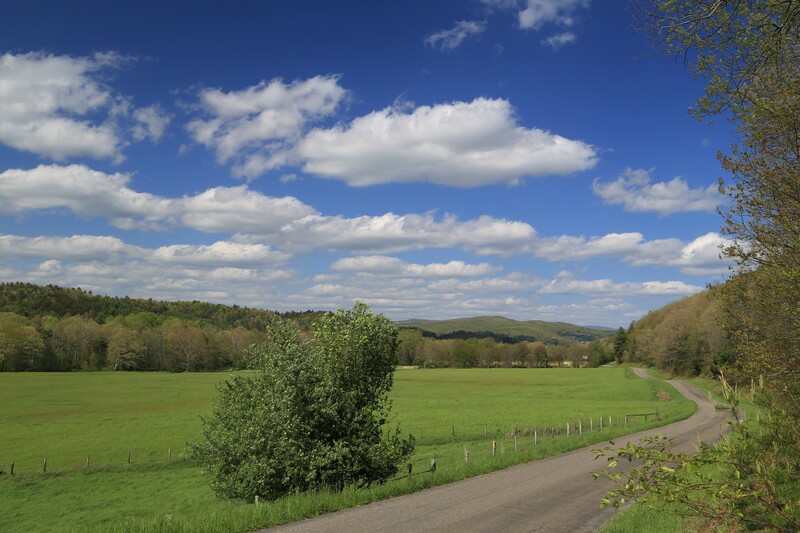 North-south running roads offer a pretty easy drive as they follow narrow valley corridors, a mostly agricultural landscape between ridges. 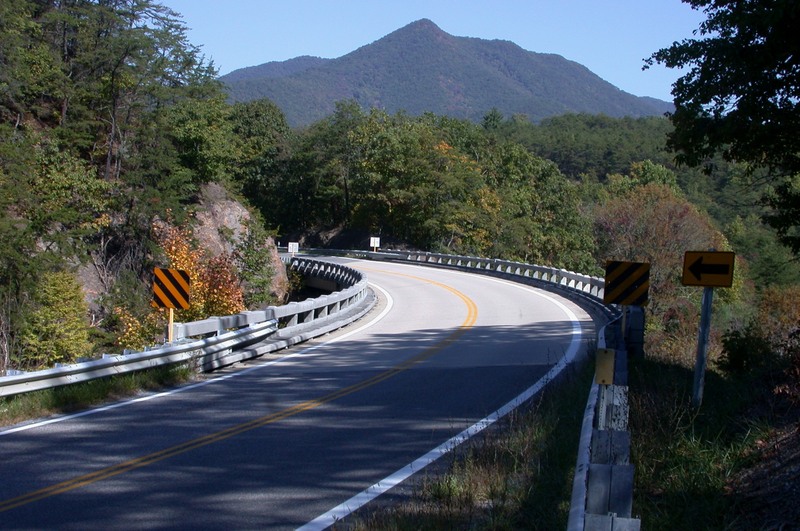 The east-west running roads, except where they pass thru a gap or valley, tend to “cut across the grain” so to speak, encountering hairpin curves, switchbacks, and steep gradients as they climb and descend mountains ad infinitum (be kind to your brakes, try down gearing). Some geographical clarity (I hope! 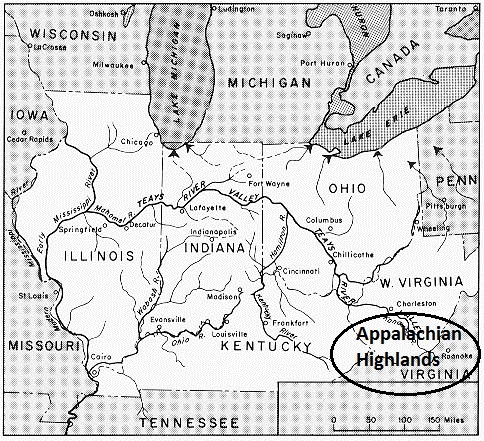 ): The term, “Appalachians” comprises ALL of the mountain ranges in the eastern half of North America,; i.e. 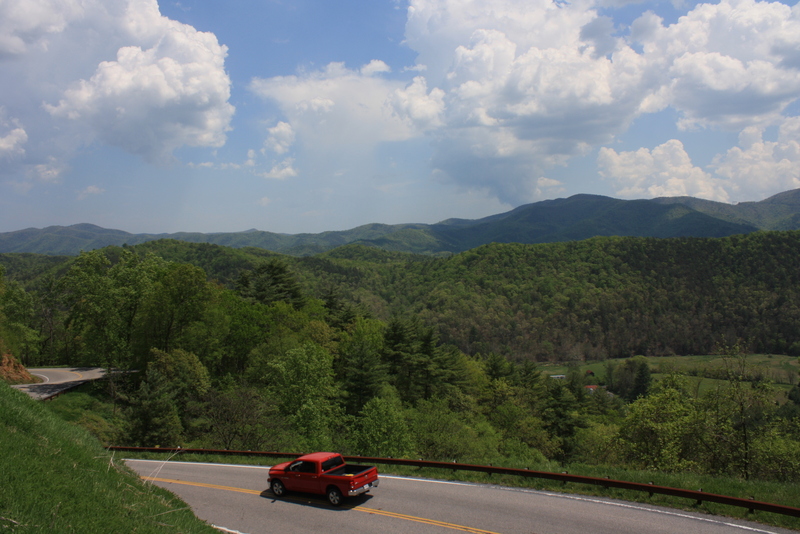 the Smokies, White Mountains, Adirondacks, Blue Ridge, etc., that stretch for 1,200 miles from northwest Alabama to the maritime provinces of eastern Canada. 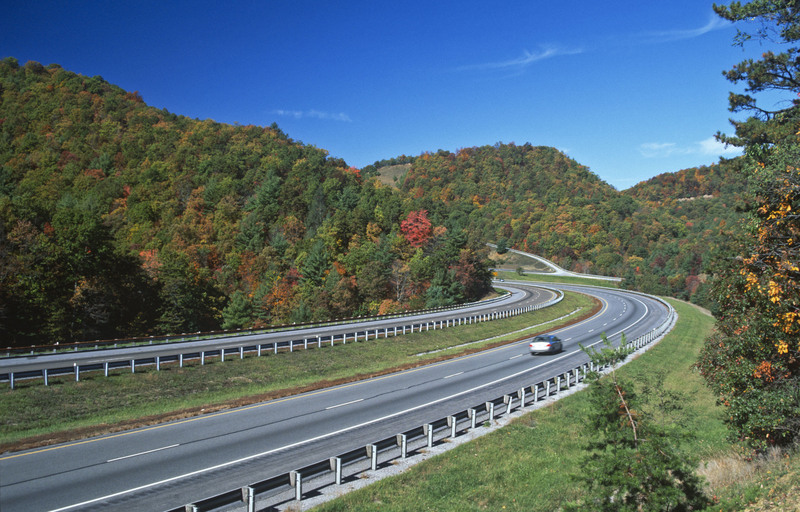 The “Alleghenies” comprise the central area of the Appalachians, mainly in Virginia, West Virginia and western Pennsylvania. However each state often uses both names interchangeably to describe their respective mountainous regions. 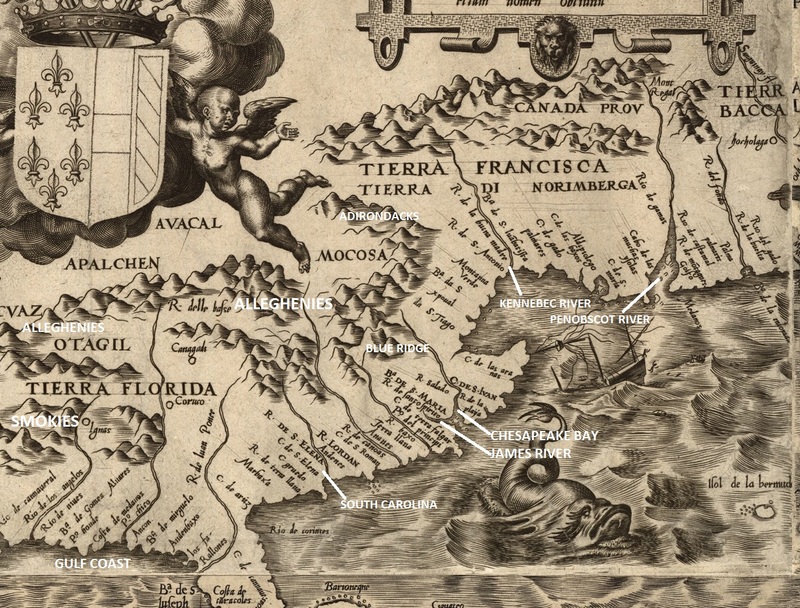 Detail of Diego Gutiérrez’s 1562 map of North America, showing the first known use of a variation of the place name “Appalachia” (“Apalchen”). From the map Americae sive qvartae orbis partis nova et exactissima descriptio . “Our greatest difficulty is the roads. It has been raining in these mountains about six weeks. It is impossible to get along. 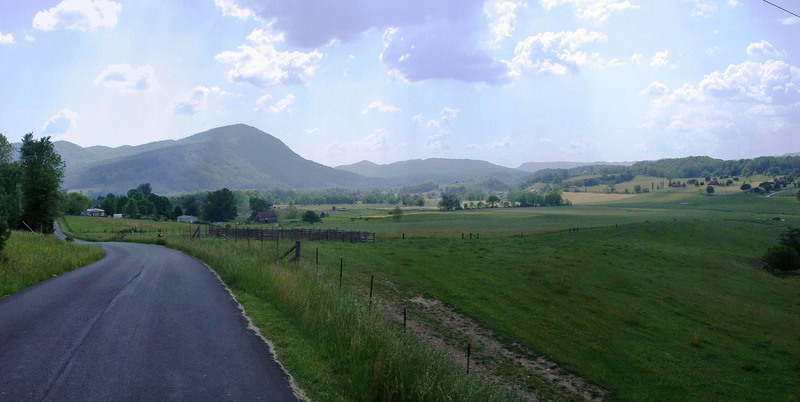 It is that which has paralyzed all our efforts.” – Gen. Robert E. Lee, letter written from his camp in the Alleghenies, September, 1861, to Governor John Letcher. In 1944 President Roosevelt signed legislation authorizing the development of a “National System of Interstate Highways.” Another decade would pass before President Eisenhower signed the Federal-Aid Highway Act of 1956, thus beginning construction of our Interstate System, hailed as “The Greatest Public Works Project in History”. Touring the wreckage of post-war Germany in 1945, Eisenhower was impressed with the German autobahn and how it was still in operation despite massive Allied bombing. As President during the Cold War he saw the need for a similar network of reliable, all-weather superhighways here in America that would help speed the evacuation of cities and aid in the rapid movement of military convoys and supplies in the event of a nuclear attack or natural disaster; while also serving the vital peacetime mission of connecting the different regions of the country, promoting commerce, and for better or worse, ending the isolation of many parts of rural America. Allegheny County, I-64, Clifton Forge. Clean, well-maintained, and lightly traveled. 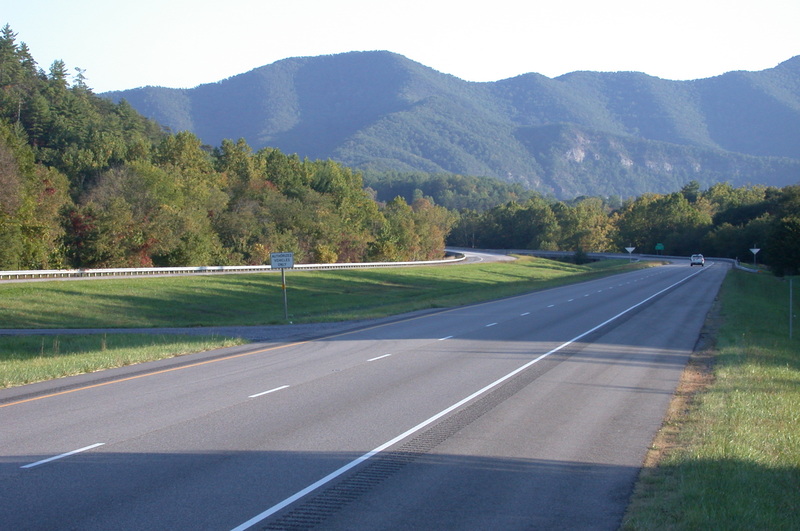 Bland County, I-77, looking west towards Short Gap. 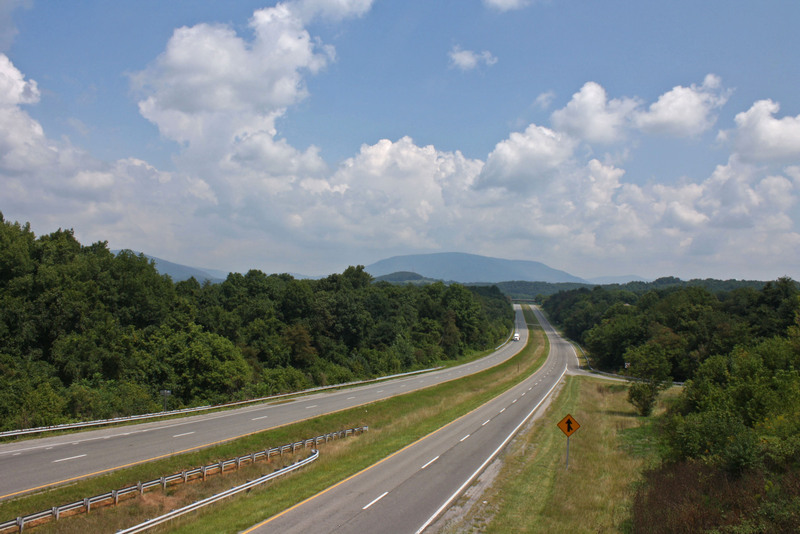 When the passage of highway bills stalled in Congress in 1955, including the financing of the interstate system, President Eisenhower was pissed; “Adequate financing there must be’, he said, ‘but contention over the method should not be permitted to deny our people these critically needed roads.” He never forgot the two month long, first U.S. Army trans-continental motor convoy that he helped coordinate back in 1919, the same journey today takes about five days, less of course if drugs are involved. Bumping along at a tortoise-like pace, an average of 6 mph, they encountered detours, unsafe bridges, poorly marked junctions, potholes, low spots with no drainage channels, rockslides, fallen trees, and few services; it all remained in his memory and reinforced his desire that America should one day have a modern, regularly-maintained, national road network. No doubt America’s aging infrastructure woes of today would see him taking executive action, how he’d propose paying for it without raising taxes would be interesting to see. Some context though, as evidenced by the outstanding, near perfect condition of many of the roadshots displayed here, not all of America is falling apart. Maintenance and upkeep yes, but crumbling and beyond repair? Don’t think so, America isn’t throwing in the towel yet. 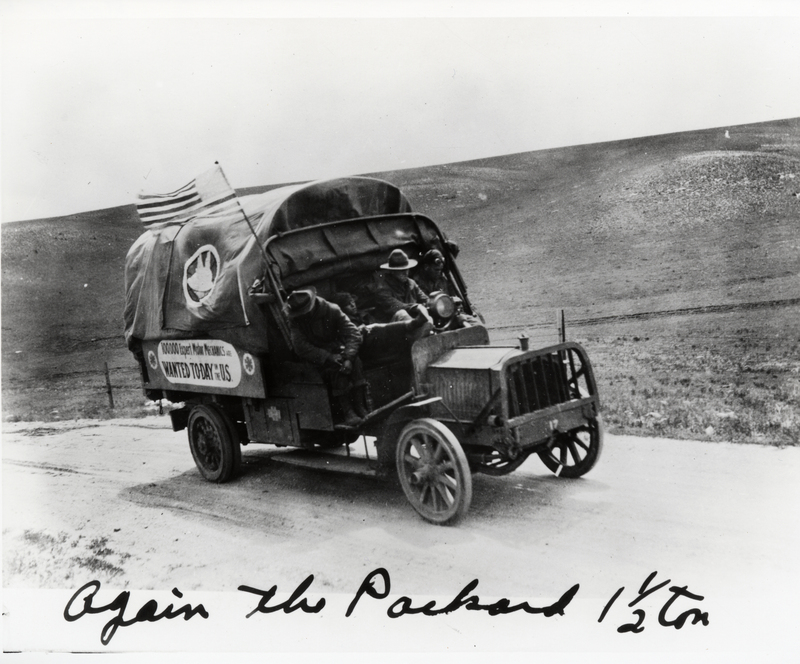 A 1 1/2-ton Packard sporting a recruiting sign heads down a dusty road during the original 1919 transcontinental motor convoy. 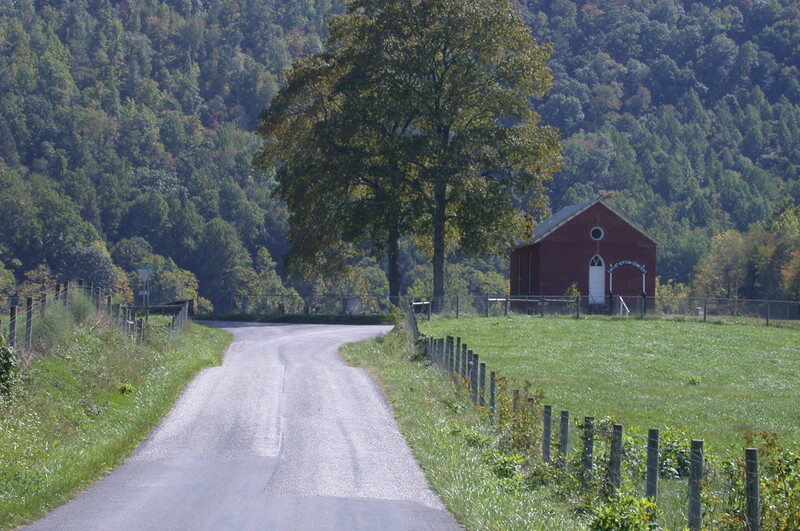 Augusta County-W. Augusta Rd (Rt 716), looking east towards Great North Mountain in the background. 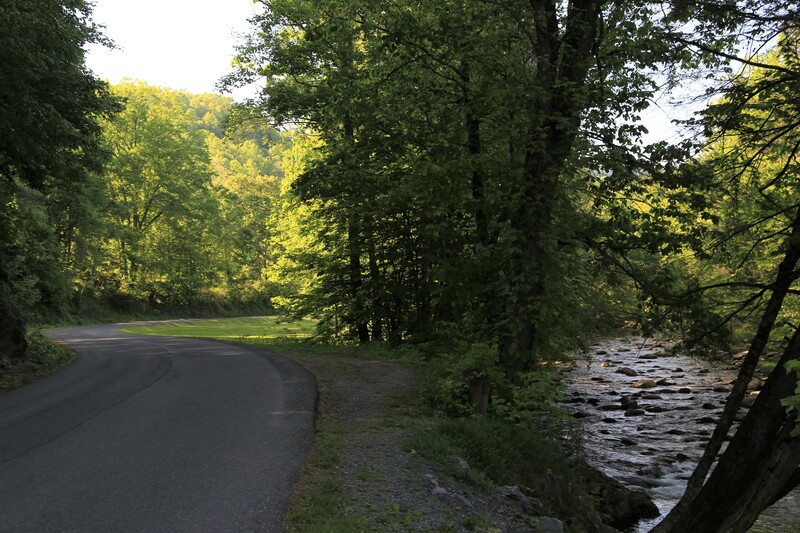 Now a rural backcountry road, Rt 716 was originally a busy section of the Staunton-Parkersburg Turnpike. 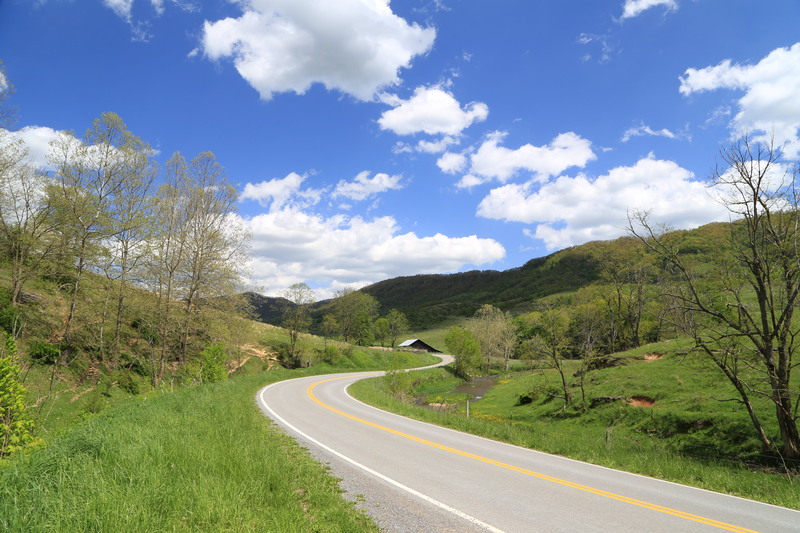 During the time of westward expansion in the 1800’s this was the main highway thru what was called at that time, Virginia’s “Trans-Allegheny” region. 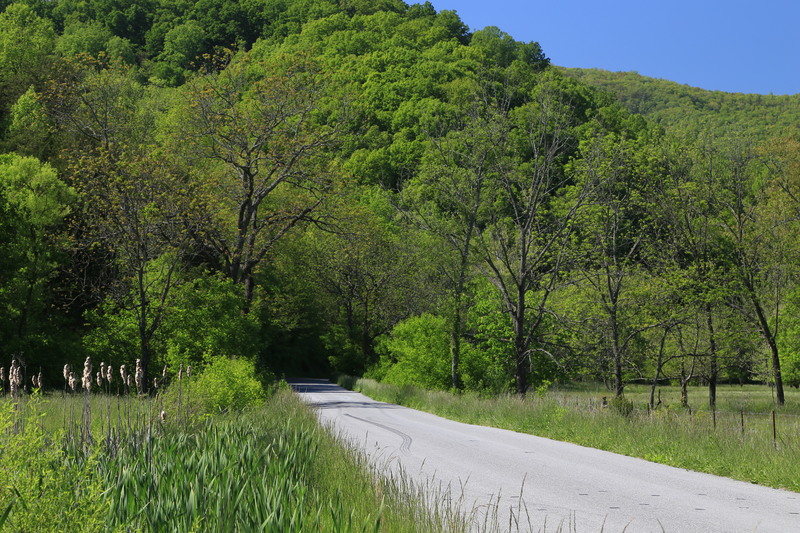 Now a lightly used dirt road, it once carried wagon-traffic, ox-carts, loners on foot, and the dreams and hopes of landless pioneer families bound for the Ohio River and the open prairies beyond. 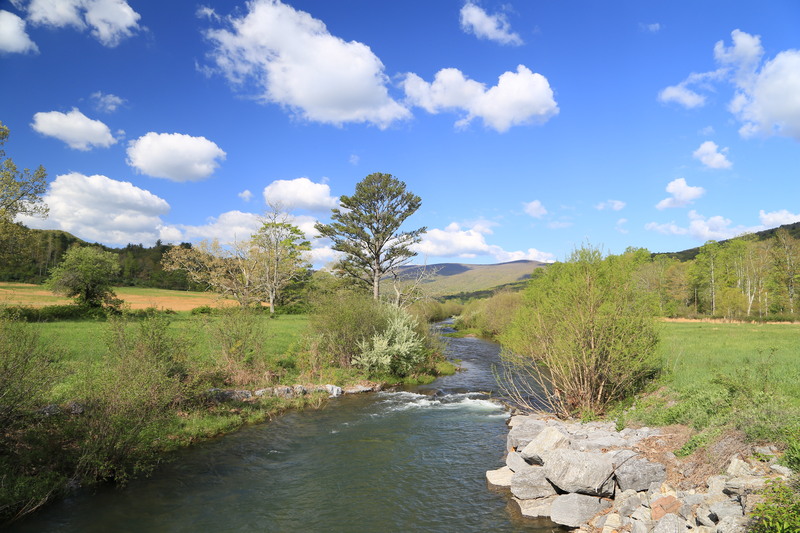 Flowing northward from headwaters in North Carolina, carving and transecting its way across the Alleghenies of Virginia and West Virginia, the “New” River has been called one of the oldest rivers in the world. But age estimates vary widely from 320 to 10 million years old, scientists aren’t exactly sure. 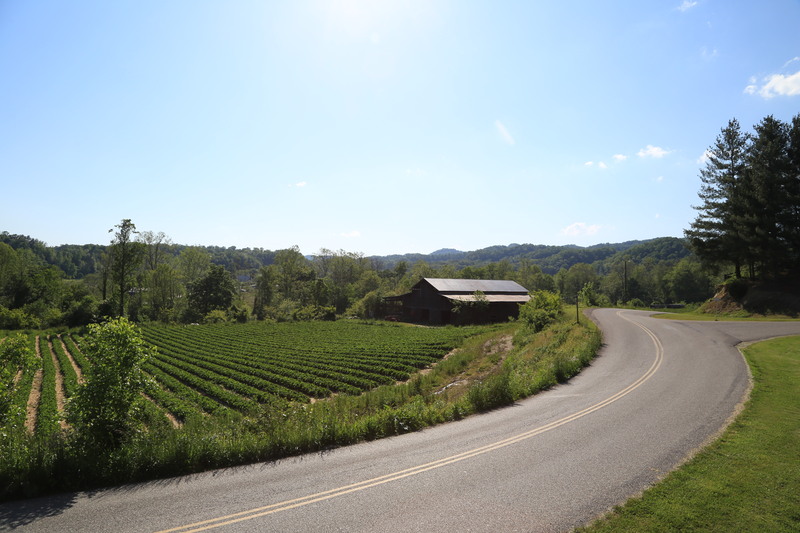 What we do know is that it follows the course of the ancient Teays River Valley and that it was flowing for untold millennia long before the Alleghenies came into existence. Approximate course of the Teays River superimposed on a modern map. This grand river flowed east to west during the Tertiary Period, 2 million years ago before being buried under repeated glacial advances. Lone trucker heading westbound on Route 460, Pearisburg. Straight ahead in the distance is Sinking Creek Mountain, site of catastrophic mega-landslides at the end of the Pleistocene Age, the largest ever in North America. Geologists believe there were many “block-slides”, i.e. 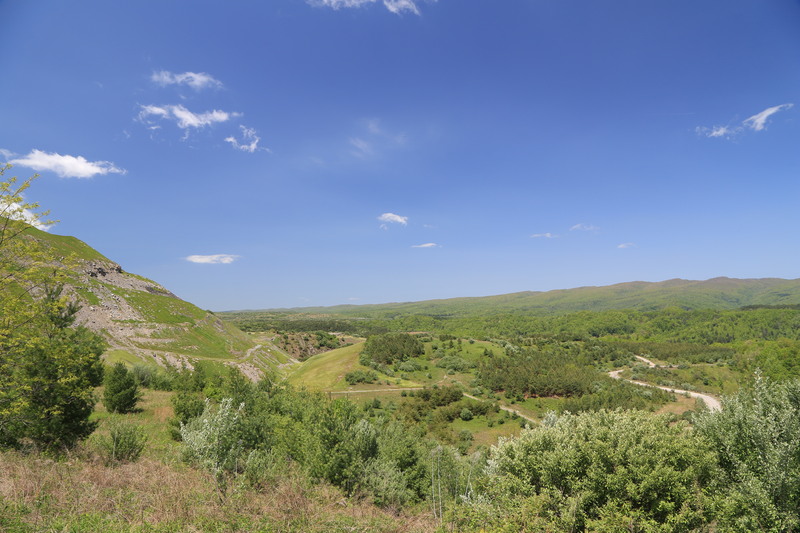 enormous chunks of rock, some as large as 1.5 mile square, and up to 3 miles in length, that came crashing down the eastern slopes of this mountain between 10,000 and 25,000 B.C. ; probably long before Paleo-Indians were in the neighborhood. “Rock of Ages” indeed. 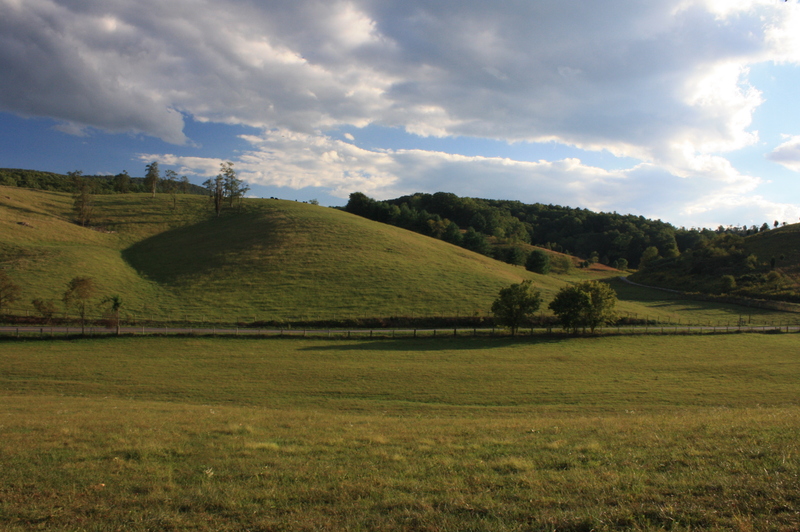 A pleasant summer sunset on the slopes of Salt Pond Mountain(above) belies the power of an event that took place in these parts over a century ago. On May 31, 1897, Giles County was the epicenter of a major earthquake estimated at a magnitude VII, or roughly 5.8 on the Richter scale, the strongest ever known in Virginia history and second largest earthquake in the eastern United States in the last 200 years (the Charleston, South Carolina earthquake of 1886 is nu#1). 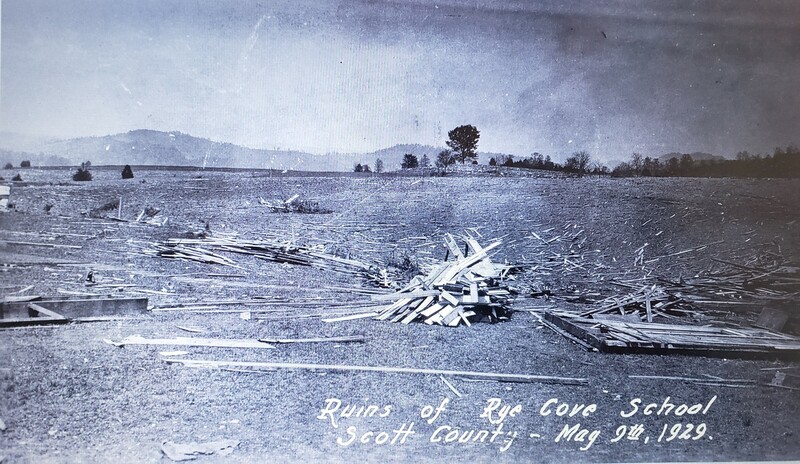 Its effects caused little damage outside Giles County but rattled buildings and frightened citizens from Lake Eire to coastal South Carolina, from Baltimore, MD to as far west as Indiana and Kentucky. Isoseismal map for the Giles County, Virginia, earthquake of May 31, 1897. 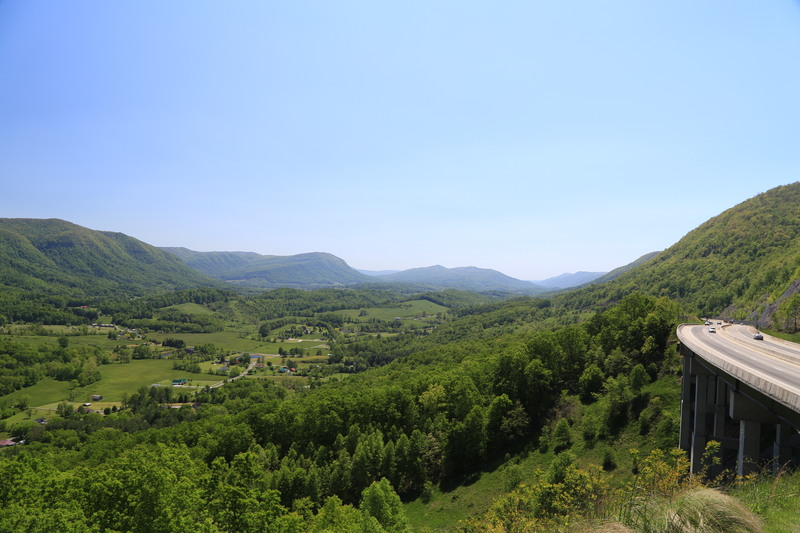 “Prior to European settlement, the landscape of southwestern Virginia included forests of different ages interspersed with expansive open woodlands with grassy understories, and occasional dense cane thickets, barren areas, and swamps. Forests were constantly changing as a result of receding of the glaciers to the north, fantastic beaver activity, large grazing animals like the eastern woodland bison, uncontrolled lightning fires, and widespread Native American use of fire and crop cultivation. Unfortunately, most of the forests on the George Washington & Jefferson in the 21st century are about the same age. This is because much of the forest was logged in the late 18th century and early 19th century. This was before there were many foresters in the United States. Also, most people did not think about the effects that logging such large areas would have on wildlife, soil, and downstream water quality. 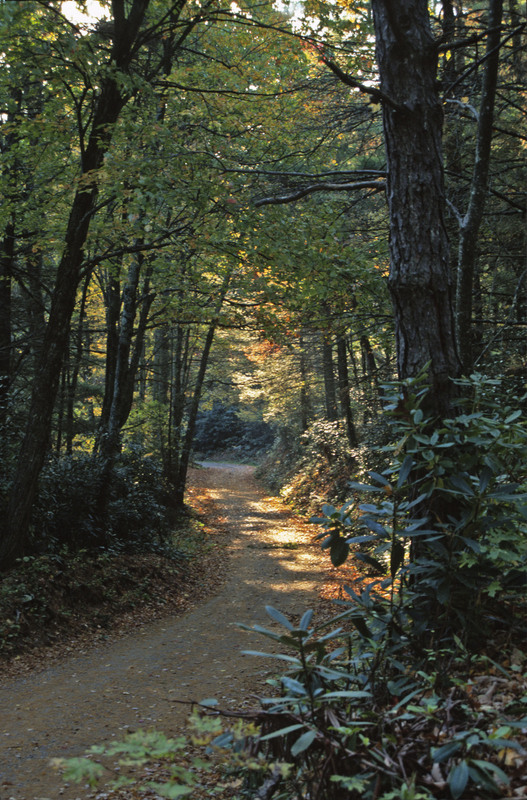 Today, the majority of the George Washington & Jefferson National Forests are between 70 and 100 years of age. 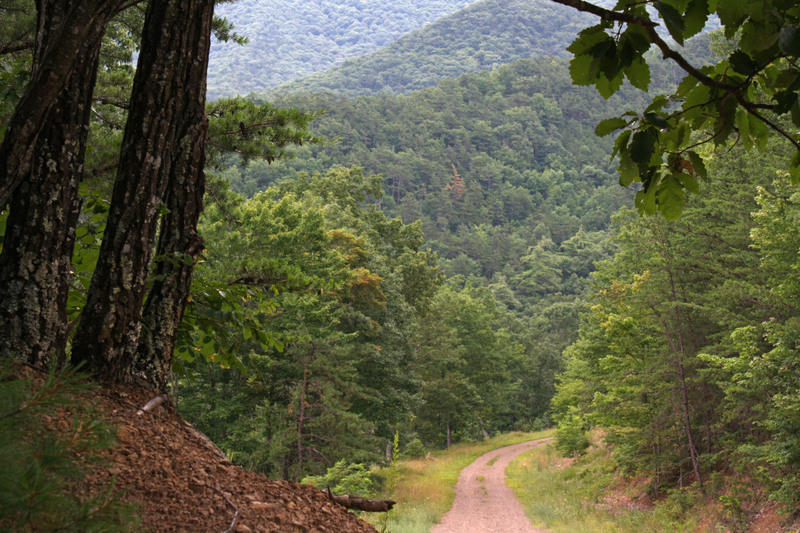 Only one percent of the Forests are less than 10 years old and only one percent of the Forests are over 150 years of age.” -USDA, George Washington and Jefferson National Forests publication. 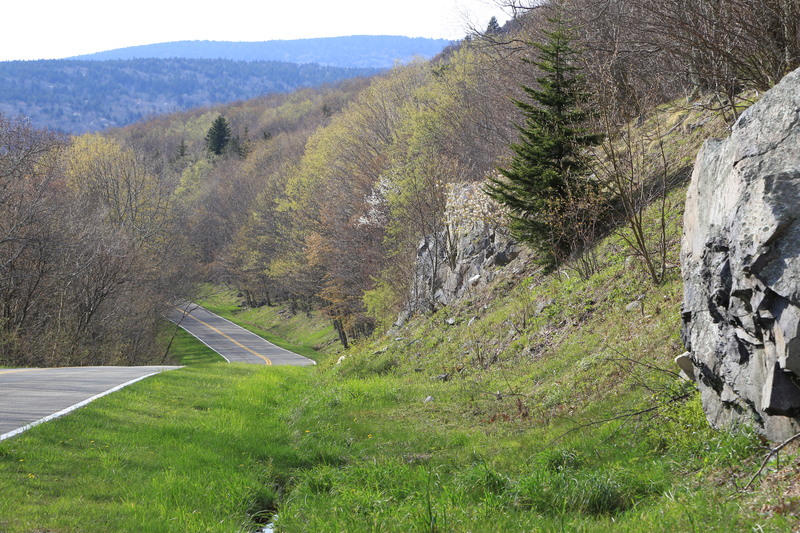 Grayson Highlands State Park scenic road, with view of Mt. Rodgers (elev. 5728′ feet) in the distant background. 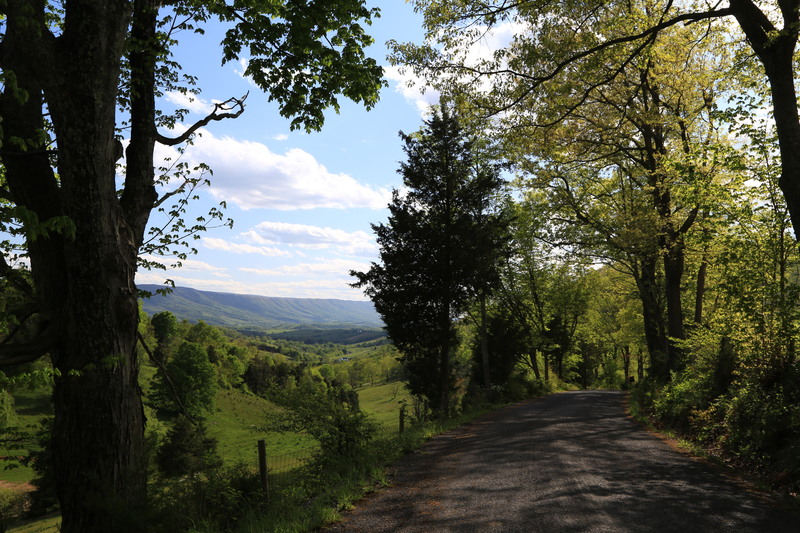 The Grayson Highlands, Virginia’s highest mountain range, an area once thickly covered in an evergreen forest of fraser fir and red spruce, “so thick, it was like darkness underneath”. All of the virgin timber was cut and long gone by the 1920’s but since then, under forestry management, the forest has returned while much of the high country has been purposely kept open as pasture thru controlled fires and cattle grazing. Washington County-Rt 725-Taylors Valley, along the North Carolina border. 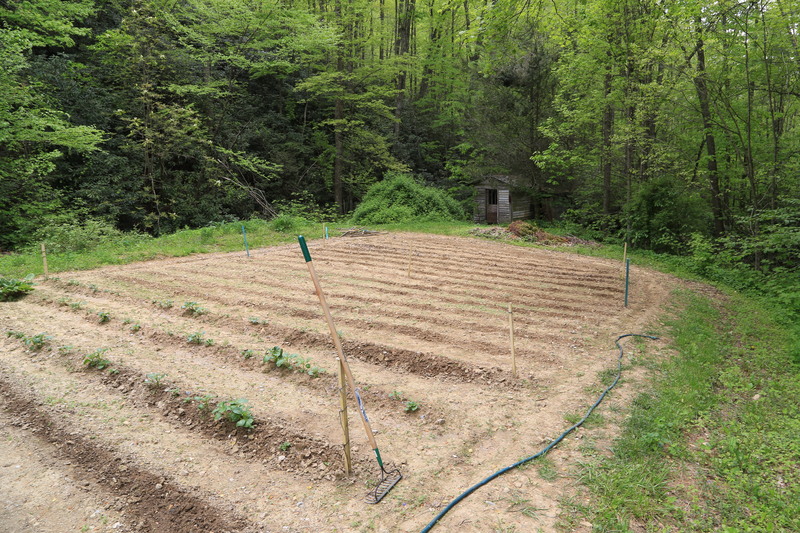 Roadside garden, tilled and ready for planting, Taylors Valley. According to the Old Man of the Mountain its not as productive a site as it was 30 years ago, the trees have grown tall and now keep it in shade for all but a few hours each day. But he ain’t complainin’, and after showing me all his seedlings and plans for this years garden he kindly told me , “you come on back anytime, ya hear?” Sometimes I have to confess that most so-called “backwoods” folk possess infinitely superior knowledge of life than many of the successful, articulate,wealthy individuals I’ve known. Its certainly a long ways from the American suburbia I grew up in,with its splendid homes and finely-trimmed yards where most people barely make eye contact. Its well-documented that Spanish soldiers in the 1500’s, beginning with the De Soto Expedition and followed by several others, traveled thru the Carolinas and Tennessee where they fought many pitched battles with the native inhabitants and built several temporary log forts, but the northernmost limit of their explorations remains unclear. 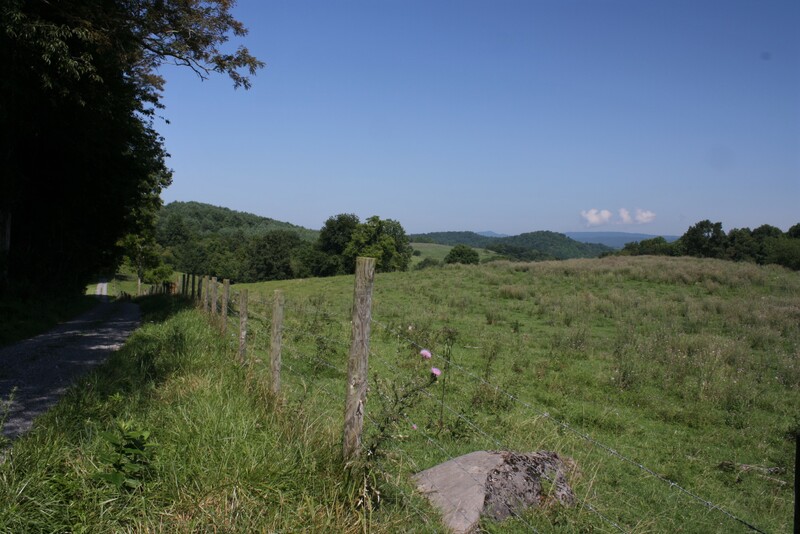 Though not conclusive, there is evidence from several written sources that indicates a small expedition of Spanish soldiers known as “Moyano’s Foray”, accompanied by Indian allies from the North Carolina Piedmont, might have traveled into present-day southwest Virginia in 1567 on their way to raiding the Chisca village of Maniateque, present-day Saltville. 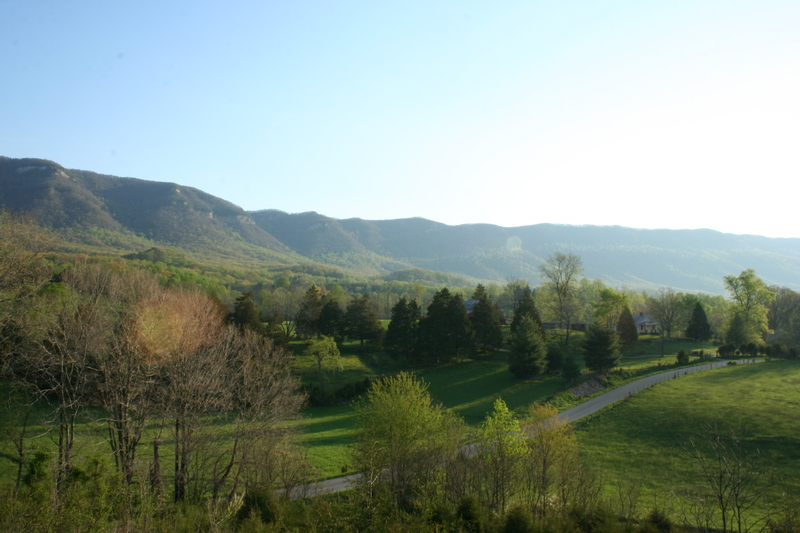 Perhaps one day a researcher in the Archivo General de Indias (General Archives of the Indies) in Sevilla, Spain, will uncover a hitherto lost letter or diary spelling out details that prove beyond a shadow of a doubt a Spanish presence in the hills of Virginia’s Appalachia. 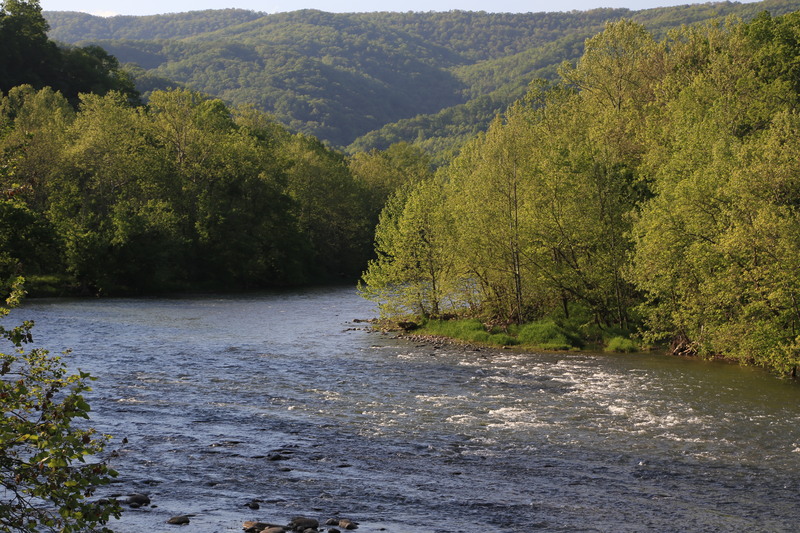 Or, just as likely, a local farmer tilling bottomland along the South Fork of the Clinch River will turn up a fragment of a harquebuss, a rusty belt buckle, or a small piece of a Toledo sword bearing a faded Spanish inscription, any of these items would be an exciting find but until then this is mere speculation. So far no conquistador artifacts have shown up and no Chisca are left to tell us their side of the story. Imagine five hundred years ago a small group of Chicsa warrior-hunters sitting on the banks of this small creek in this lush valley hundreds of miles away from more populated areas near the Atlantic coast and roughly equally distant from the mound-builders further west that live along a mighty river the Seneca called Ohi:yo’, meaning “Good River”. It’s a humid, slightly warm summer day as they patiently watch, wait, and observe, no one speaks, they know how important it is not to be seen or heard as several elk just a few hundred feet away graze in a meadow they had intentionally burned in the autumn months the year before. Their focus changes as one of them notices a slow-moving herd of woodland bison emerging from the treeline at the base of the mountain over a mile away. Nearby, a cougar is also patiently watching this scene from a large branch high up in a centuries-old red oak tree that easily survived the conflagration of the previous fall. Suddenly a pack of hungry gray wolves dashes out of hiding and into the open and the bison and elk quickly disperse in different directions. The hunt is over for now but tonight the men will sit around the fire sharing stories, one will open a small box or bundle and share its contents with the others. The pipe bearer will sing a hunting song as the men smoke. Around midnight under the canopy of heaven they’ll go to sleep, hungry, but secure in the knowledge that tomorrow might see their medicine work better. 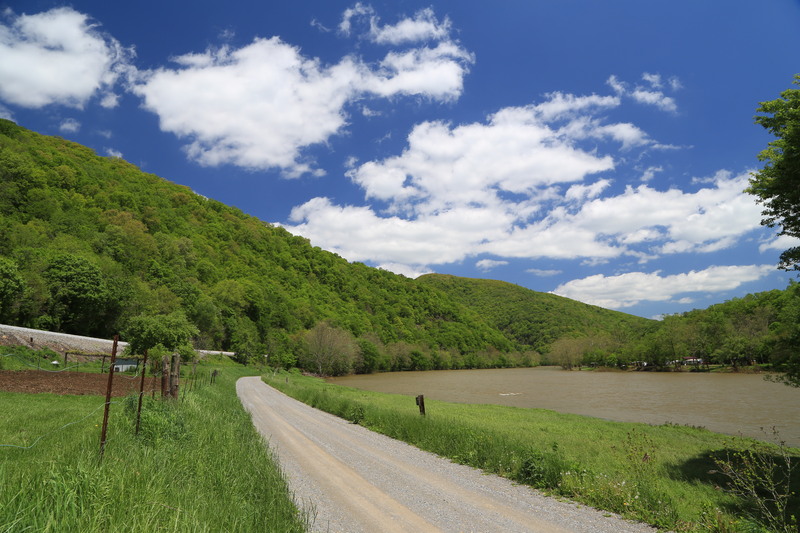 Wildlife agencies in southern and central Appalachia receive a number of reported cougar sightings every year, which often turn out to be misidentifications or deliberate hoaxes. There have been some confirmed sightings, however, including a widely publicized 2014 report from a farm in Bourbon, Ky. After the farmer’s neighbor called the Kentucky Department of Fish and Wildlife, an officer from the agency shot the cat, believing it posed a threat to the public. Mark Marraccini, information officer at Kentucky Department of Fish and Wildlife, doesn’t believe the Bourbon cougar arrived in the state on its own. According to Marraccini, the cat was too well fed to be wild and probably escaped or was released by its owner. DNA tests were withheld while a criminal investigation for illegal trade was underway, fueling a long-standing theory that state agencies have covered up evidence of cougars in the region. Doug Markum with Tennessee Wildlife Resources Agency says the conspiracy theory is really just a matter of miscommunication. 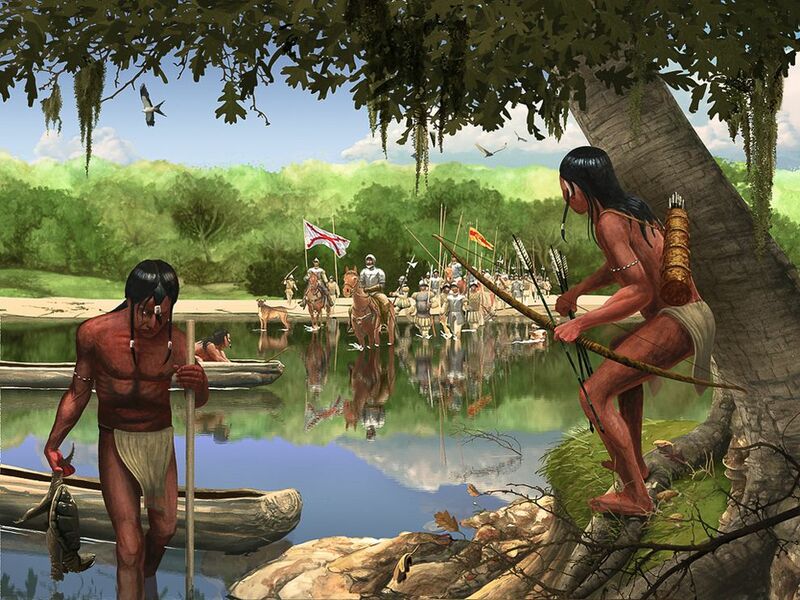 DeSoto crosses the Oculmeege River, Georgia (from a National Geographic article), a depiction that could easily be Captain Moyano and his men crossing the Holston River in the Appalachian region of southwest Virginia in 1568. 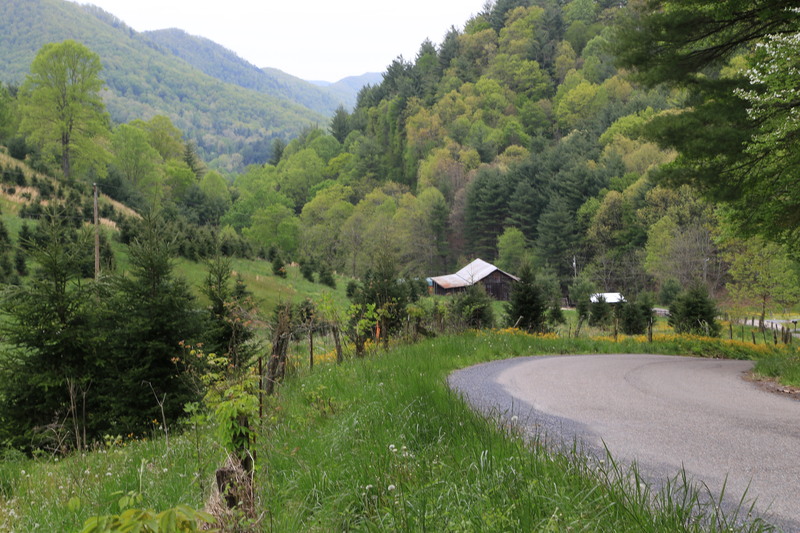 Bland County-Hunting Camp Creek Rd south of Bastian, road is concealed in the treeline on far right side of picture. “I look around me-no road at all! Driver, where are we going? 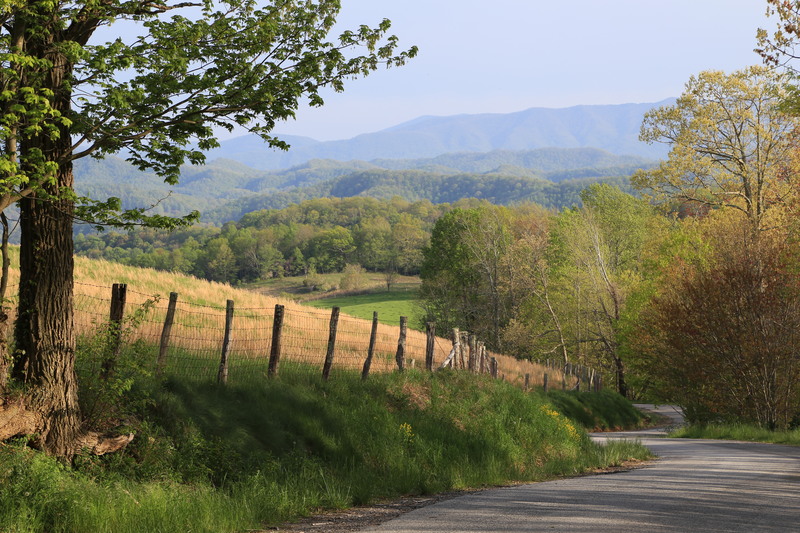 Heading to the high country in summer to escape the sweltering heat of lowland areas and big cities is not a new concept. 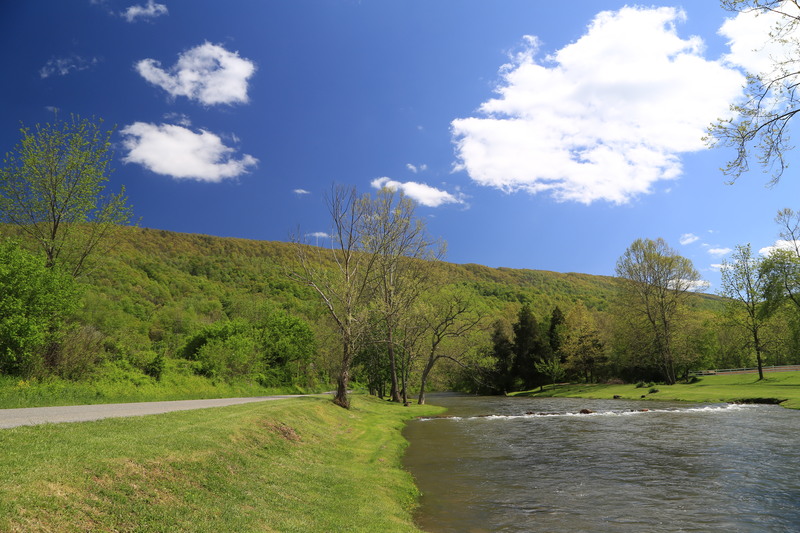 Early travelers from Jefferson and Lafayette to Civil War generals and wealthy Victorian-era tourists traveled by horseback, bateau, buggy, and rail, to enjoy the soothing qualities of mineral springs and the “cool airs” of various mountain resorts throughout this region. 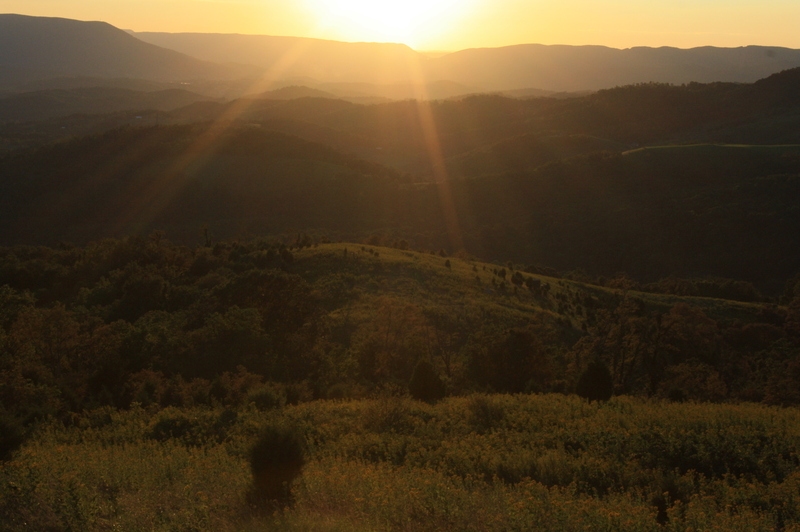 Fortunately today you don’t have to be a member of the upper crust to enjoy this region. 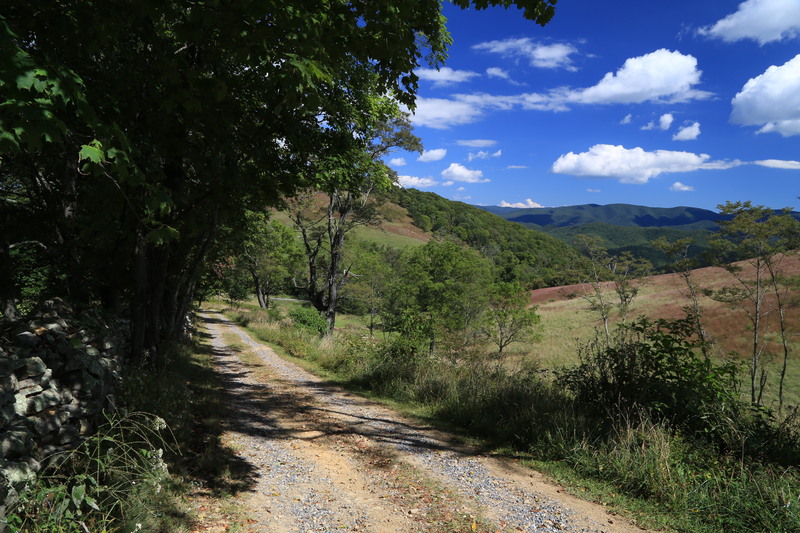 Like our National Parks, the public lands of Appalachia, including large areas of national forests, state parks, and wildlife management areas, all belong to you and me, forever. 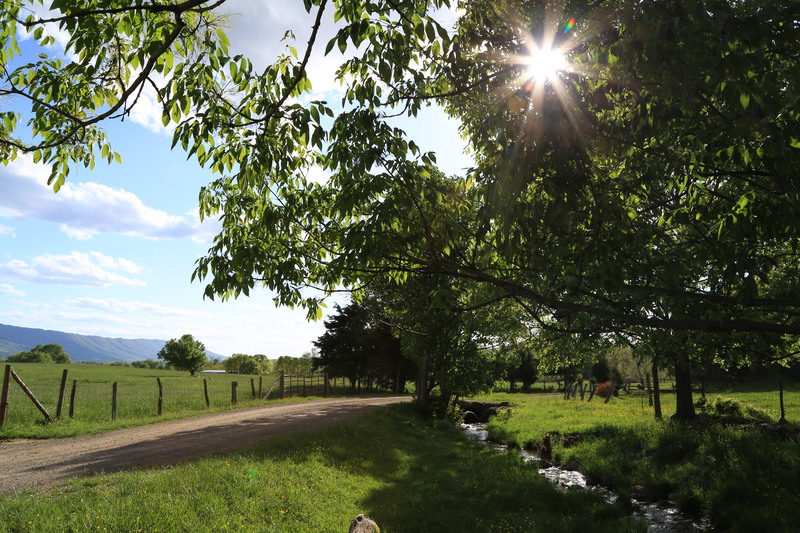 Scott County is the birthplace of country music legends, the Carter Family and one of the great female country singers of all time, June Carter Cash; a legend and sweetheart sorely missed. 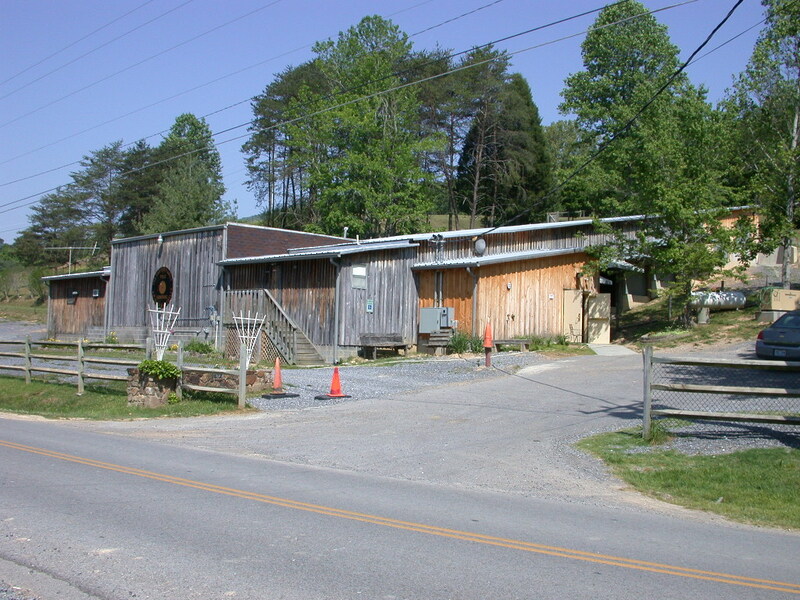 Johny Cash, “the man in black”, played his last gig here at Carter’s Fold, a historic music venue located in a barn in Poor Valley at the foot of Clinch Mountain. 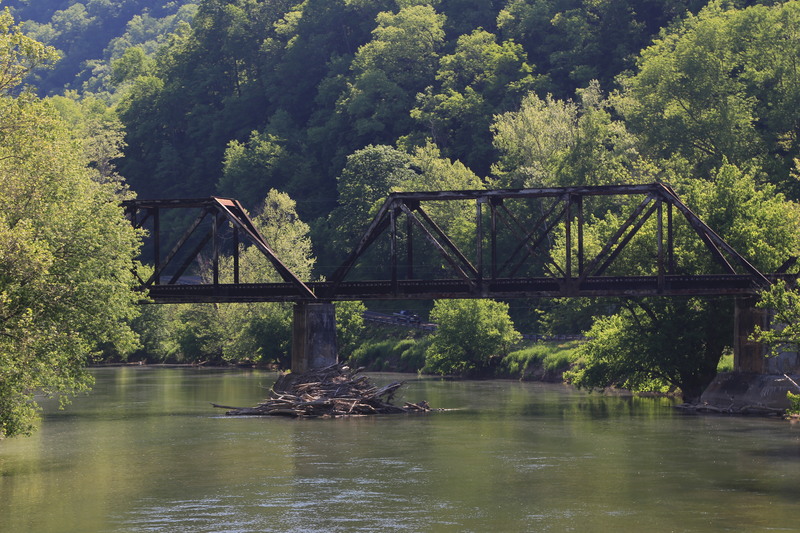 Scott County-Rt 65 and railroad bridge over the Cinch River at Clinchport. 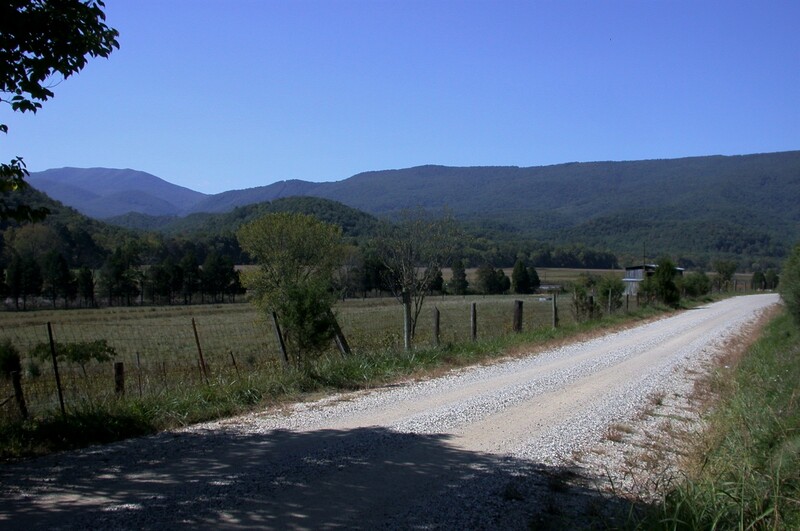 Lee County-Route 58, Wilderness Road, Caldwell’s Gap. Rt. 58 parallels the east slopes of Cumberland Mountain, capped by “White Rocks”, view looking northwest. 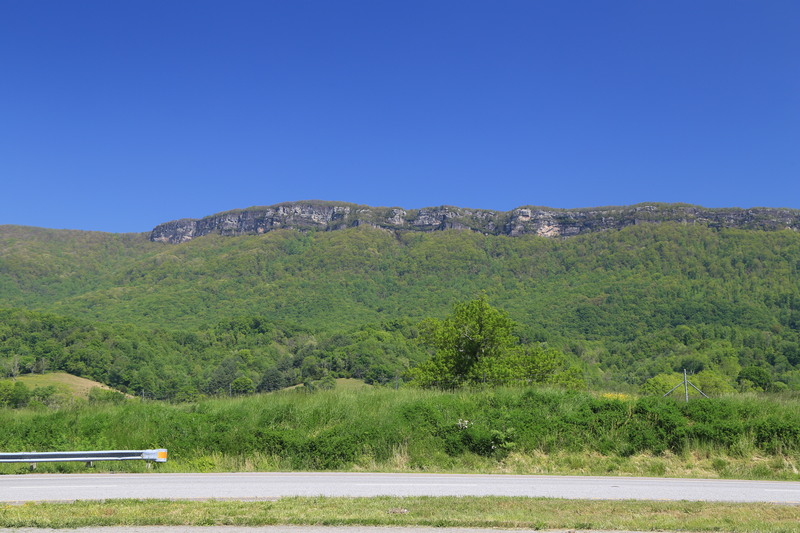 For early immigrants traveling the Wilderness Road, seeing these cliff formations meant only one more day of travel before reaching the Cumberland Gap and the big turn to the west, to the bluegrass country of “Kaintuck”. 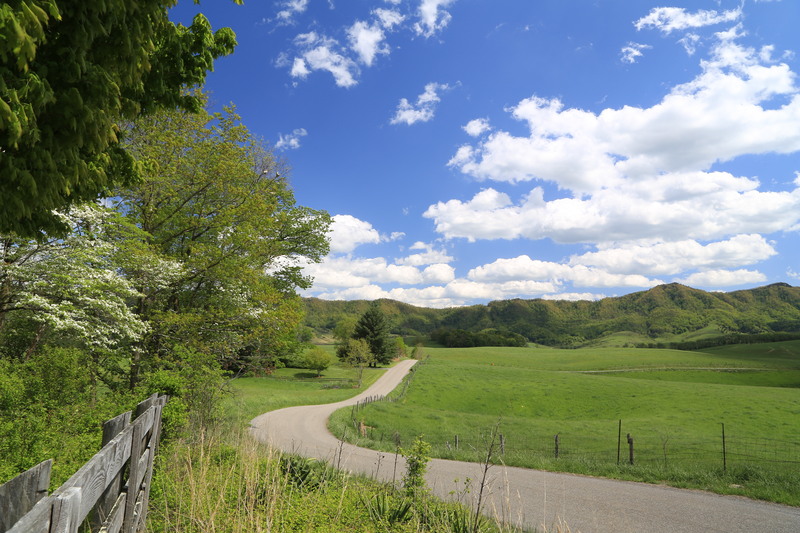 Lee County is the westernmost county in Virginia and site of the Cumberland Gap, a famous historic and natural landmark where Virginia, Kentucky, and Tennessee come together. In the early 1800’s this natural low pass was the main thoroughfare to the west for thousands of early pioneers and their families. 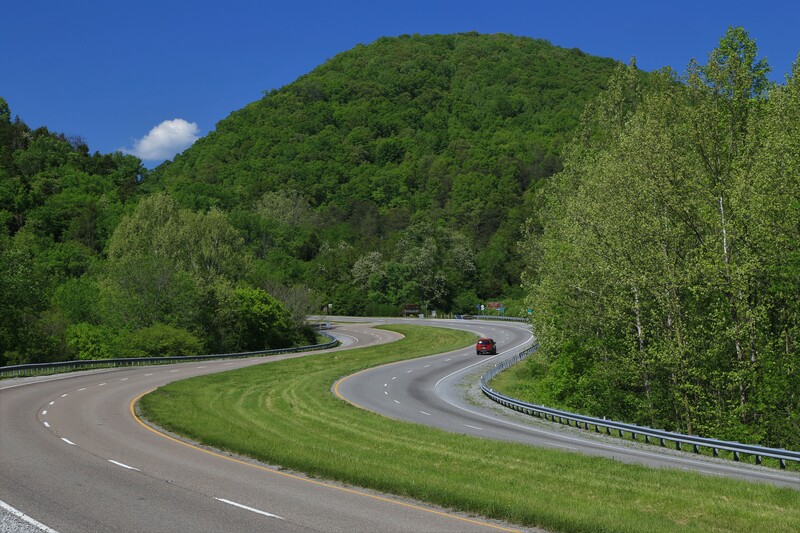 Its importance as a portal thru the mountains pre-dates the coming of the white man of course, various Native peoples had been using the Cumberland Gap for millenia in their travels between the southern Appalachians and Ohio River country. 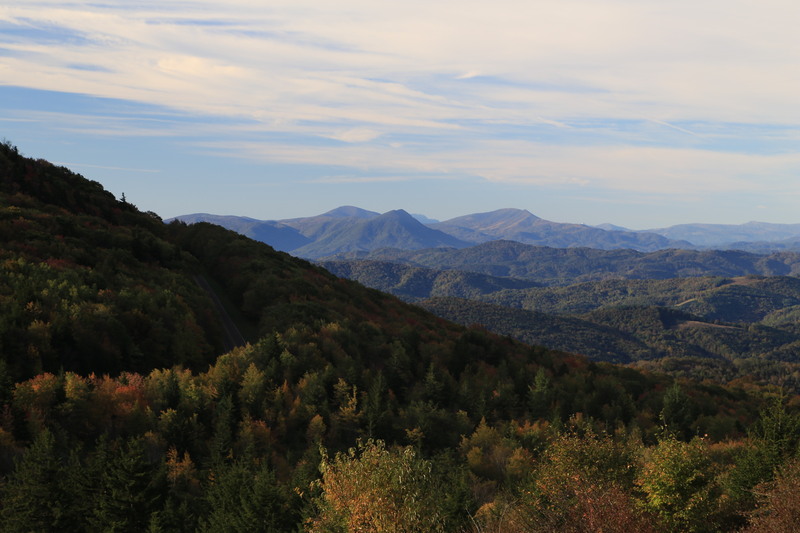 Lee County-view of three states looking from summit above Cumberland Gap. Virginia (and Rt 58) is on the far left, Tennessee is in the middle foreground, and the low-lying cloud formations on the far right are above Kentucky. The famous gap is directly beneath these rocks and goes left to right as marked by the thin stream of clouds seemingly pointing the way west on the right side of the picture. 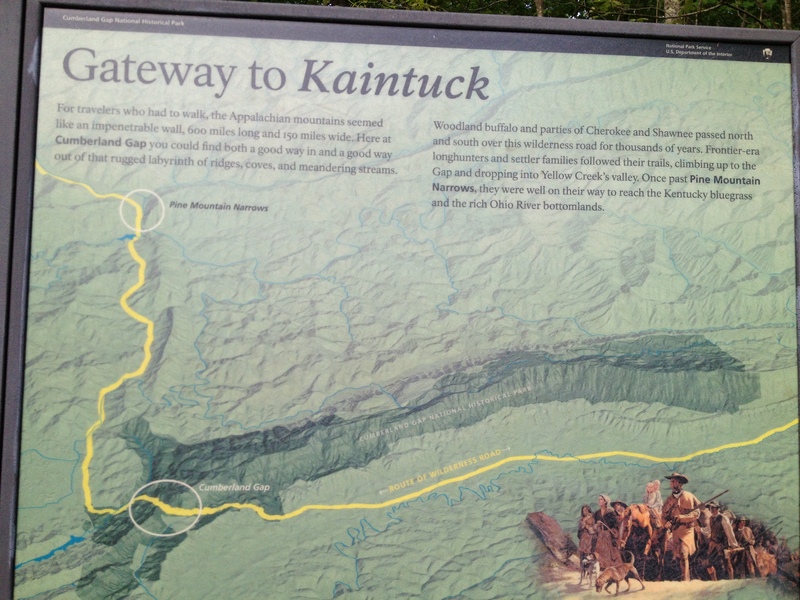 “The Great Indian War Path”, or “Athawominee”, Algonquian for “Path where they go armed” was the main north-south foot trail thru the central Appalachian valleys linking numerous tribes of the intermontane east; including the Iroquois of Pennsylvania and upstate New York, the Monacan, Shawnee and Mingo of Virginia and Ohio, the Catawba and Cherokee of the Carolinas and Tennessee, and Creek, Chickasaw, and Choctaw in the deep south. 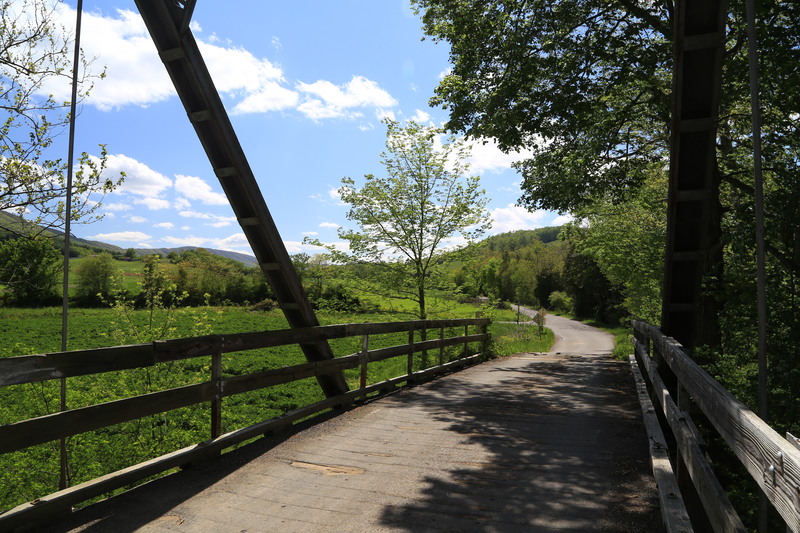 It branched off with many trails, some that would later become modern highways including the Catawba Trail, Cumberland Trace, Kanawha Trace, Great Shamokin Path, and Old Chickasaw Trace. Posted in UncategorizedTagged alleghenies, Bath County, Bland County, burkes garden, carter's fold, Cherokee, chisca tribe, Clinch River, Corn Valley, cumberland gap, daniel boone, Eisenhower Interstate System, giles county, grayson highlands, I-64, I-77, jefferson national forest, juan pardo expedition, martin's station, mound builders, mount rodgers, moyano's foray 1567, powell valley, Russell County, saltville, Shawnee, Shenandoah Mountain, Southwest Virginia, Staunton-Parkersburg Turnpike, tazewell, Thompson Valley, Virginia appalachian region, virginia earthquakes, Wards Cove, wise county, wythe countyBookmark the permalink.